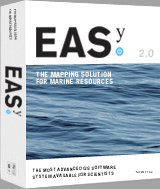 EASy is the dynamic (time-based), 4-dimensional home for data, allow 2-dimensional (map-based) visualization with interactive drilling and slicing of dynamic 3 dimensional fields. EASy handles both historical and real-time data streams. It graphically renders dynamically in time, within their proper geo-spatial context, both field and remotely sensed data and model outputs as diverse types of plots, including vector, contour, and false color image plots. Vertical structure of data, critical in oceanographic applications, is depicted as vertical contours for user-defined transects or depth profiles at selected point locations. Time series of measurements, and dependencies between data at individual stations can also be visualized interactively as XY-plots. Graphical images. Furthermore, EASy can export images, measurements, and model data in formats accessable from scripts created with the 'R' statistical package.